March 29th, 2019, Taipei, Taiwan – BIOSTAR, a leading manufacturer of motherboards, graphics cards, and storage devices, presents the A68MHE motherboard for mainstream users. 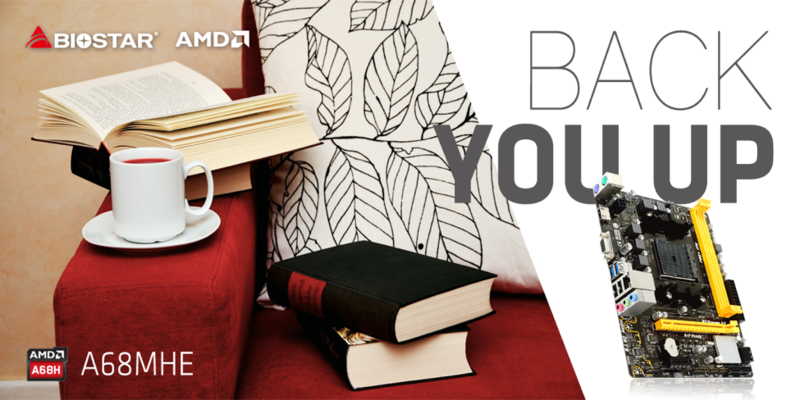 The BIOSTAR A68MHE features the AMD A68H chipset that supports AMD’s Socket FM2+ Athlon™/A- Series processors and DDR3 memory. The A68MHE packs two DIMM slots supporting up to DDR3-2600(OC) memory and a maximum capacity of 32GB, more than enough to provide excellent performance for home and office platform. The BIOSTAR A68MHE is a balanced motherboard that has the power to handle any office tasks and accomplish everyday home and entertainment use. For office and workstation builds, the A68MHE delivers high-speed data transfer and able to connect multiple devices with Gigabit Ethernet (GbE) LAN, 2 x USB 3.1 Gen1 connectivity and a total of 8 USB ports. Home users can enjoy high-resolution and visually immersive multimedia content for videos and streaming services like YouTube and Netflix with support of UHD resolution displays via HDMI. The AMD A68H chipset is designed for entry-class motherboards to support up to 5Gb/s interface speed and PCI Express™ 3.0/2.0 graphics. It natively supports SATA 6Gb/s ports and USB 3.1 Gen1 Ports. It also supports AMD Radeon™ Dual Graphics technology with supporting AMD APU processors and AMD Radeon™ graphics. The BIOSTAR A68MHE supports up to DDR3-2600 memory in OC mode, taking advantage of the cheaper yet capable DDR3 memory for building an affordable mainstream PC for home and office use. The BIOSTAR A68MHE supports 2K and 4K displays with its HDMI 2K4K technology via HDMI with 3840 x 2160 resolution. Enjoy 4K UHD movie and video playback for an immersive home entertainment experience. The BIOSTAR A68MHE delivers 5Gbps of fast data transfer speed using the USB 3.1 Gen1 interface. Users can connect up to 2 USB 3.1 Gen1 Type-A devices to the ports on the rear.USB 3.1 Gen1 is backwards compatible with previous USB 2.0 components. The BIOSTAR A68MHE’s rear I/O includes 1 x PS/2 Mouse, 1 x PS/2 Keyboard, 2 x USB 3.1 Gen1 (5Gb/s) Ports, 2 x USB 2.0 Ports, 1 x HDMI Connector (supports 2K/4K resolution depending on the CPU), 1 x VGA Port, 1 x GbE LAN port, and 3 x Audio Jacks. 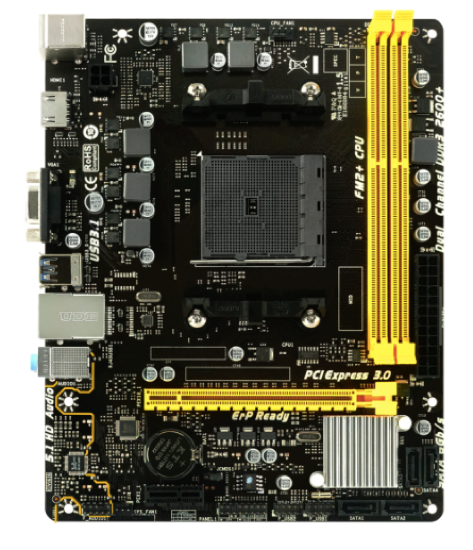 The BIOSTAR A68MHE motherboard is an ideal solution to create affordable and capable PCs for home, entertainment, and work use with a set of affordable DDR3 memory and AMD FM2+ A-series APUs. 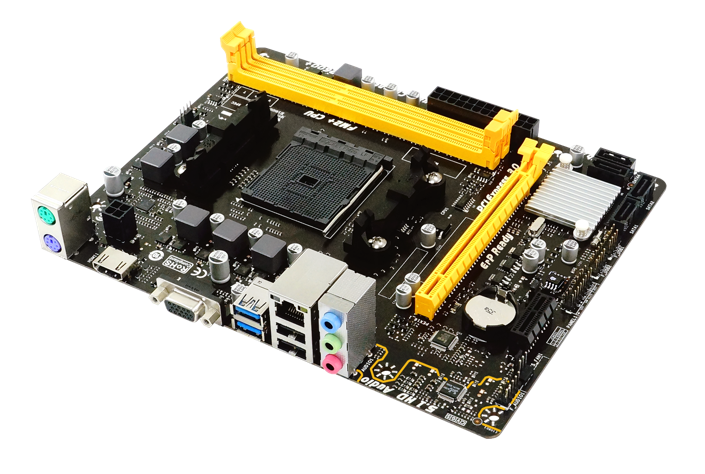 The BIOSTAR A68MHE offers advanced technologies including high-speed USB 3.1 Gen1 interface, PCI-Express 3.0, and support for high-resolution 2K and 4K displays in a very affordable and compact micro-ATX package.